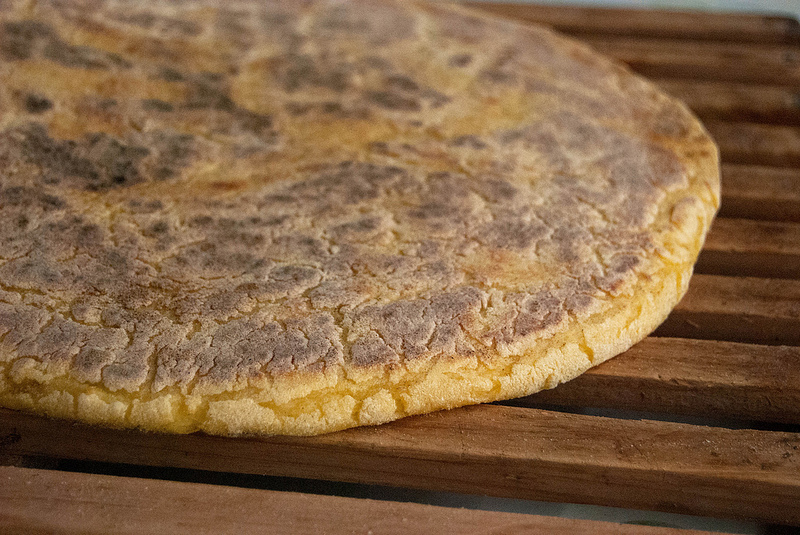 Bolo de Sertã is an Azorean specialty unleavened flat bread made by the combination of corn and wheat flour. A sertã is a flat circular cooking surface traditionally made of clay that is used to cook the bread. If you do not have a sertã available, you may also use a large nonstick frying pan. Bolo de Sertã is perfect for serving as a complement to many typical Azorean dishes such as some chicharros, some traditional fried marinated pork, as well as many stews. It can also just as well be served on its own as a snack. Simple and easy to make. 1) Place the corn flour and salt into a large bowl and mix. 2) Pour about one half of the boiling water over the corn flour. Stir it well. 3) Add the remaining hot water as you continue to stir. 4) Set aside for 20 to 30 minutes. 5) Mix in the all purpose flour and 1/3 cup water. 6) Knead the dough for about 5 to 10 minutes, making sure all the flour is incorporated. 7) The dough should be a little lumpy, soft, and not very elastic. Let it rest for about 10 minutes. 8) Divide the dough into two equal parts and form them into ball shapes. 9) Dust one ball with flour and and then gently flatten it to a thickness of 1/4 inch. Make sure the flattened dough is not larger than the pan it will be cooked in. 10) Place the flattened dough carefully into the pan. 11) Cook on medium/low heat for about 20 minutes until the bottom is golden brown. 12) When it is golden, flip to cook the other side. 13) When done, place it on a serving platter with paper towels to dry. 14) Repeat the process with the second piece of dough. 15) Once done, place the second piece on the serving platter. Serve while hot. You should have the recipes able for us to print. It would be much easier than to write it done. A suggestion!